George Bell was born in 1957 in Portsmouth, Virginia. Growing up, George never felt out of place. At that time, he was of average height for his age. It wasn’t until George was in his early 20s, when he noticed his height exceeding seven feet. When George last measured himself, he was 7 foot 7. But George apparently grew an inch, according to Guinness, who measured him at 7 foot 8. This classified him as the tallest man in the U.S. George played college basketball at Morris Brown College and Biola University. After college, George went on to play for the Harlem Wizards and the Harlem Globetrotters show teams. Once George’s basketball career came to an end, he became a deputy sheriff in Norfolk, Virginia for 15 years. George served the community as an officer of the law and an advocate for underprivileged and abused children. George’s unique height allowed him to be featured in acting roles on the AMC show Freakshow, which ran for two seasons, as well as appearing in season 4 of American Horror Story. George even had the privilege of making an appearance as an alien landing at the closing ceremonies of the 1984 Summer Olympics in Los Angeles. 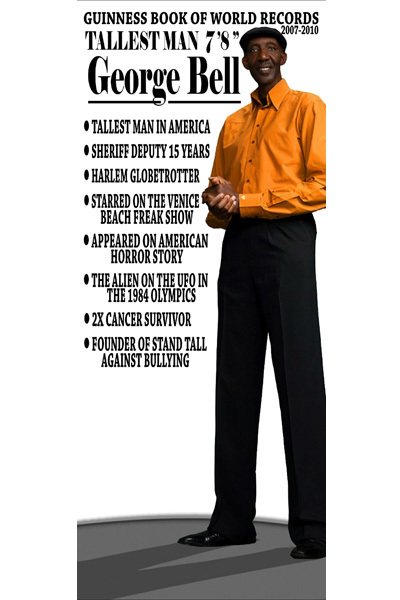 George currently lives in Las Vegas, Nevada, where he initiated his foundation, STANDING TALL AGAINST BULLYING. His foundation will provide resources for students and parents dealing with cyber bullying. George’s stature and personality makes him stand out in any environment. He is working various trade shows throughout the country, bringing attention to the company he is representing, and awareness to cyber bullying.